First official record: possible version of the play entered into Stationers' Register by Peter Short on 2 May 1594 as "a booke intituled A plesant Conceyted historie called the Tayminge of a Shrowe." First record of the play as it exists today is found in the First Folio (1623). First published: possible version of the play published in quarto in 1594 as A Pleasant Conceited Historie, called The taming of a Shrew (printed by Peter Short for Cuthbert Burby). This text was republished in 1596 (again by Short for Burby) and 1607 (by Valentine Simmes for Nicholas Ling). The play as it exists today was first published in the First Folio as The Taming of the Shrew. Additional information (publication): there is a general lack of scholarly agreement regarding the exact relationship between the 1594 A Shrew and the 1623 The Shrew. 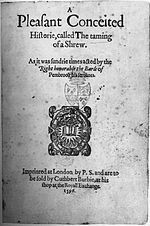 Originally, A Shrew was seen as a non-Shakespearean source for The Shrew, meaning The Shrew must have been completed sometime after 2 May 1594. This remained the predominant theory until 1850, when Samuel Hickson suggested that A Shrew was in some way derived from The Shrew. Peter Alexander developed Hickson's work into his reported text/bad quarto theory, which necessitates that The Shrew must have been written prior to 2 May 1594. However, there are other theories about the relationship between the texts. In 1942, R.A. Houk posited the "Ur-Shrew" theory, suggesting that the plays are two completely unrelated texts by different authors based on the same (now lost) source. In 1943, G.I. Duthie refined this theory, suggesting that A Shrew was a reported text of an early draft of The Shrew. In his 1998 edition of A Shrew for the New Cambridge Shakespeare: The Early Quartos series, Stephen Roy Miller suggested A Shrew was an adaptation of The Shrew written by someone other than Shakespeare. Critics remain divided on this issue. First recorded performance: according to Philip Henslowe's diary, a play called The Tamynge of A Shrowe was performed at Newington Butts on 11 June 1594. This could have been either the 1594 A Shrew or the Shakespearean The Shrew, but as the Admiral's Men and the Lord Chamberlain's Men, Shakespeare's own company, were sharing the theatre at the time, and, thus, Shakespeare himself was probably there, scholars tend to assume that it was The Shrew The Shakespearean version was definitely performed at court before Charles I and Henrietta Maria on 26 November 1633, where it was described as "likt." Evidence: a terminus ante quem for A Shrew would seem to be August 1592; a stage direction at 3.21 mentions "Simon," which probably refers to the actor Simon Jewell, who was buried on 21 August 1592. The Shrew must have been written earlier than 1593, as Anthony Chute's Beauty Dishonoured, written under the title of Shore's wife (published in June 1593) contains the line "He calls his Kate, and she must come and kiss him." This must refer to The Shrew, as there is no corresponding "kissing scene" in A Shrew. There are also verbal similarities between both Shrew plays and the anonymous play A Knack to Know a Knave (first performed in June 1592). Knack features several passages common to both A Shrew and The Shrew, but it also borrows several passages unique to The Shrew. This suggests The Shrew was on stage prior to June 1592. However, Kier Elam further narrows the terminal date of The Shrew to 1591, based on Shakespeare's probable use of two sources published that year; Abraham Ortelius' map of Italy in the fourth edition of Theatrum Orbis Terrarum and John Florio's Second Fruits. As neither Shrew play is likely to have been written any earlier than 1590, this places the likely date of composition of The Shrew as 1590–1591, with A Shrew written sometime prior to August 1592.